Developers across the nation are noticing the many benefits of salt therapy and are now implementing them into their spas. Ranging from therapy sessions, soaks and Himalayan experiences, this form of therapy can benefit cell activity, energy, and blood and sugar levels. According to the Global Wellness Institute, the negatively charged ions in salt improve health, mood and reduce respiratory conditions such as asthma, allergies to name a few. Florida Amrit Ocean Resort & Residences, Salt Inhalation Therapy Chamber I Located within “Amrit’s AAYUSH” amenity (meaning longevity in Sanskrit), the salt inhalation therapy chamber (aka salt room) at Amrit can help alleviate a number of respiratory ailments, and skin conditions (like eczema, acne, etc. ), as well as contribute to overall wellness and improve allergies. As a mineral, salt is naturally antibacterial, anti-inflammatory, and anti-fungal. 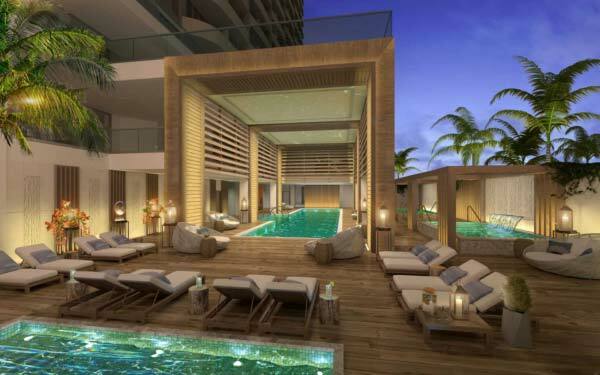 The combination of amenities located in AAYUSH make up the only multi-level indoor/outdoor hydrothermal experience in Florida and one of the largest in the United States (over 40,000 sq. ft.). Available to guests and residents on the property, “The AAYUSH Hydrothermal Experience” will include a hydro-reflexology path, replenishment pools, inhalation therapy chamber (salt room), effusion shower and a full hammam.